Enjoy a ladies’ night out that’s bubbling with good times at 888ladies Bingo. The site is delightfully pink and pretty, with a definite feminine feel. But don’t let that fool you; 888ladies is open to all – to all who enjoy great bingo games and a couple of laughs, that is. As we’ll see in our 888Ladies review, it is easy as pie to sign in or sign up. First time playing bingo? Never fear, the 888Ladies Bingo Textbook is here to teach you all you need to know about the game before you jump in. Then fill out the convenient registration form, pick a bingo room where a game is about to begin and get started playing. 888ladies offers bingo games in several flavors – 90 Ball Bingo, which is as British as fish and chips, or beefy American 75 Ball Bingo. There are plenty of games scheduled throughout the day and evening, including freebies, and the friendly chat is all part of the fun. Team Bingo provides you a chance to party with your BFFs every two weeks, as your team earns extra bingo points together. Progressive jackpot games are where the extra big cash prizes are up for grabs, just waiting for someone to take them home. Between bingos, keep yourself out of trouble – and in the running for more fabulous payouts – by playing 888ladies’ suite of casino games. If you’re a gal or guy on the go, the 888ladies mobile app will let you be a part of the bingo action anytime, anywhere. Bonuses and promotions add to your bingo fun, as 888ladies hands out a welcome bonus of £5 free plus a 200 percent match bonus on your first deposit. Bring a buddy to the bingo room and you both win, meaning a £15 reward for you and £27 for her to begin playing with. So many weekly, daily and even hourly special promotions are part of the pampering at 888ladies that the site sends a newsletter to your email every Thursday just to help you keep track of them all. Don’t forget the exciting Joy Gem VIP Club; move up the levels for exclusive, bonuses, mystery gifts, cash prizes and other VIP player benefits. 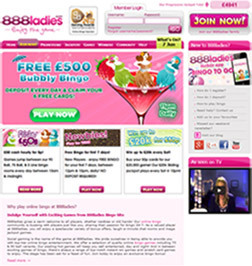 888ladies, part of the joyofbingo.com network, is owned by 888 Holdings, an online gaming provider licensed by the government of Gibraltar. Concern for customer security is a top priority for 888 and your personal information is protected by means of state of the art encryption. technology. For any questions about the bingo site, just click on the big pink “Chat Now” button to reach a customer support staffer. If you prefer, send an email or place a phone call (toll free in the UK).